1 Technique and 10 projects with 3 Quilts. Build-A-Quilt Just assemble the blocks?... and you're done! Stitch in-the-hoop embroidered & quilted blocks, use our simple technique to join them, and that's it! Make these projects as large or small as you want. Included in this book are: Instructions for the Quilted Block Joining technique. 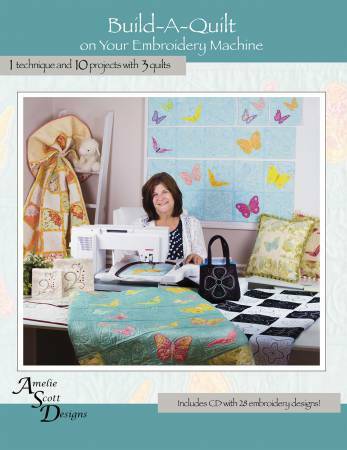 Patterns for 3 quilts, place mats, a table runner, 2 wall hangings, a pillow, and 2 tote bags. Includes CD with 28 embroidery files in 5.98", 6.98" and 7.98" sizes. Quilt resizing chart for sizes up to King. CD includes the following file formats: ?ART, DST, EXP, HUS, JEF, PES, VP3, 10o.